I write to ask for your help in gaining the freedom of a good man, a man of peace, and a man of conscience. In the Jewish scriptures there is great emphasis on justice and freedom and it is for such, for one man, that I write to seek your help. He will not be aware that I am writing this appeal, but I do so in the hope that with your help, it will produce his freedom, and not (and this I must risk) cause yet more punishment and cruelty to be inflicted upon him. However, I feel when I tell you the story, it will touch your hearts and there will be those among you who will be able to help him gain his freedom. In May 2010, this man was returned to prison to serve three months for allegedly breaking his prison release restrictions and speaking to the foreign media. On 11 July 2010, he had his first visit in seven weeks. His brother, Meir, was granted a 30-minute visit. There was a glass window between them and they spoke via phone. He wore a prison uniform. He is held in the harshest section there is in the prison. It holds the most notorious criminals in the country, well-known murder cases. About a dozen are in severe isolation conditions. He is in a cell by himself for 24 hours a day, no window but a small wire-covered crack at the top part of one wall. He has about an hour’s walk a day in a very tiny yard. He was simply thrown in a cell by the security agents, the door locked, and left to suffer there all alone. He has not spoken to anyone in all the seven weeks and this visit was (apart from a short visit of his lawyer six weeks ago) the first conversation he had in seven weeks. His food is limited in quality and quantity, and his reading material is two books he has with him. Of course his spirits are down as a result of being put in such harsh, inhuman and cruel conditions. His name is Mordechai Vanunu, and he is in an Israeli prison cell. He is no stranger to prison. In 1986 Vanunu told the world that Israel had a nuclear weapons program and he was given 18 years imprisonment for doing so. He is the Israeli nuclear whistleblower and 24 years later continues to be punished for trying to warn the Israelis and protect both Israel and the world from a nuclear weapons disaster. Vanunu served the full 18 years of his sentence (11 years in solitary) and upon release, instead of allowing him to leave Israel, the Israeli government placed severe restrictions upon him, including forbidding him to leave Israel and not to speak to the foreign media. It was the allegedly breaking of these restrictions and speaking to the media that resulted in Vanunu being returned to prison for three months. He has six weeks left to serve in these harsh prison conditions, and even upon release from prison will still have to remain in Israel until April 2011 when the restrictions will be reviewed and probably renewed yet again, as they have been renewed each year for the past six. 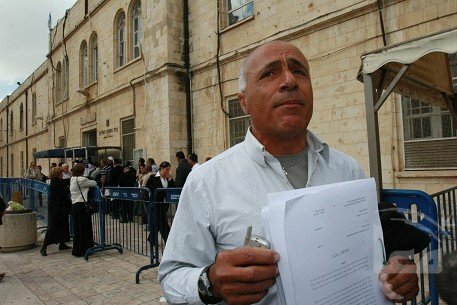 Some people say Vanunu will never be allowed to leave Israel but will die there, if indeed in the meantime his spirit is not broken by his ill treatment and he losses his sanity. The Shabak continues to tell the Israeli government he is a security risk and must not be released and the Israeli Judiciary and Government obey them and keep him imprisoned. Vanunu is no risk to Israeli national security. He has no nuclear secrets. I have asked some Israelis why they think Israel refuses to allow him to leave Israel. Various reasons are given but the most frequent answer is they feel the Israeli government does not trust its citizens and holding Vanunu — forever if necessary — sends out the signal to Israeli citizens to behave themselves. It seems, if this is so, that the strategy is working. To date only a few courageous Jewish people have raised their voices against such cruelty and injustice perpetrated upon Vanunu, and called for him to be allowed to leave Israel. But I don’t believe he will never be allowed to leave Israel and will die in Jerusalem. I have met Vanunu many times since he was released from prison on 21 April 2004. He is a good man, a man of peace, and a true Gandhian spirit. Instead of punishing him, Israel should be proud of him, and I believe that future generations of Israelis will look back and realize that there lived among them a great visionary and man of peace, not only for Israel, but for the human family. It was with great joy I nominated him several times for the Nobel Peace Prize, as did many other prominent names during the past 24 years. He richly deserves the prize, as he lives and acts in the true spirit of Alfred Nobel, who left his prize for those who would work for peace and disarmament. However, it is with the deepest sadness that I acknowledge that in spite of world campaigns by many, including Amnesty International (and personal letters from myself to US President Barack Obama and Israeli President Shimon Peres), Vanunu continues 24 years later to be most cruelly imprisoned and punished by Israel. Most political and spiritual leaders, and international bodies of our time are silent in the face of Israel’s abuse of Vanunu’s basic human right to freedom of speech and liberty, which is in violation of many international laws. However, I have hope that he will be free and I place my hope in those Jewish people who read this story and are moved to right a wrong continuing to be done to Mordechai Vanunu, and they will demand that their government give him his freedom, and allow him to leave Israel. Mairead Maguire is a Northern Irish peace activist and winner of the Nobel Peace Prize. She was on board the Rachel Corrie, a Gaza-bound aid boat diverted by Israel’s navy to Ashdod on 3 June.